Imlil Ourika valley trek: A superb 3-day hiking in the high Atlas mountain and Berber villages crossing mountain passes. You will enjoy stunning panoramic views of Mount Toubkal national park. 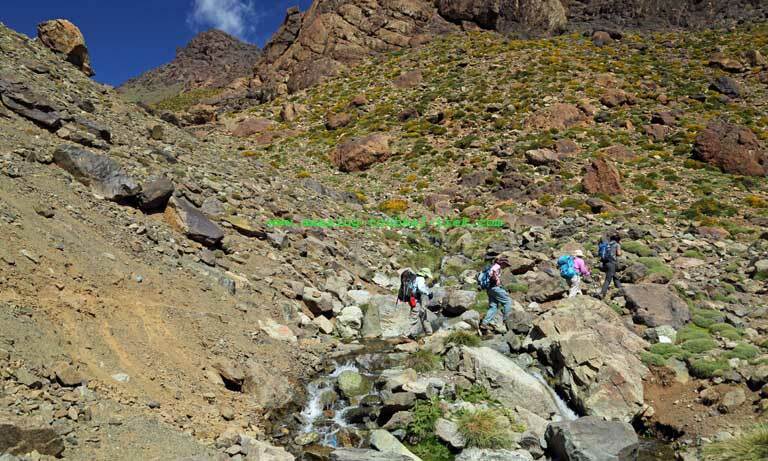 We invite you to join this walking from Imlil valley to Ourika valley in the heart of the Atlas mountain. We leave early morning Marrakech, drive to Imlil via Asni and Berber villages in the Atlas Mountains. Imlil is the principal trailhead for walkers. This is the place where we will meet our mule team. We begin Imlil to Setti Fadma trek walking along the valley towards Imnane valley, passing by Tamatert to arrive Tacheddirt village. The night would be spent in a local gîte or in tents. 5 hours of trekking. We begin the second-day journey after breakfast, walking towards Tacheddirt pass. From there, we will enjoy the best views over Imnane valley, Berber villages, and the high Atlas Mountains. After we descend to Timichi passing Ibbasen and Timichi villages. We spend the night in Berber local Gîte. 7 hours trek. After breakfast, we descend to Setti Fatma past the Berber villages of Tiourdou, Anfli, and Tadrart in the heart of the Atlas. After a lovely lunch, we continue for a short while until we reach the main village of Setti Fadma. If there’s enough time, we can visit the seven waterfalls before going back to Marrakech. 5 hours trek. – Imlil Ourika valley trek is available and can be arranged for groups of all sizes. Imlil Ourika Valley Trek: 3-day hiking in the High Atlas to discover the valleys that make the region famous.